July 2013 | Free Pc to Phone Calls, Free Voip Calls to India International ! We have been promising our blog readers that we will help them save lot of money. If you are following FPPC, then your phone bills will come down pretty soon. You will save a lot on making international and national calls. Here's another chance on how you can enter the world of voip and make cheap calls. Well, Rebtel needs no introduction on this blog. It is one of the widely used voip provider, having a large satisfied customer base. Rebtel has given many exclusive offers to our readers and all of them have been huge success. Be it the offer of giving free minutes, or the exclusive voucher bonus coupon codes. We have again partnered with Rebtel and this time we have a bigger and a better offer. To all our readers, Rebtel is offering 100% bonus on your first purchase of $10. The offer is a limited time promotional thing and will get over pretty soon. So you need to make use of it asap. Yes, you heard it right : All new users, will get $10 extra credit on purchase of $10 credit. In order words you pay just 10$ and you will get $20 voip credit : that's a whooping 100% bonus!!! Now our old readers who already joined Rebtel few years back : How can you avail this offer. Simple, just register a new account with Rebtel in your spouse names (a new number). A few words about calling rates : Rebtel calling rate to India is 1.79 cents per minute. As you are getting 100% bonus. You will get 1118 minutes to India by paying just $10. Your effective calling rate to India will be just 0.9 cents per minute. That rate is one of the industry best calling rate to India. Offcourse you can use your calling credit to call any country in the world. Rebtel offers cheap international calls to many other countries. It is widely used to call Mexico, Philippines, Pakistan and many other countries. Since you are getting double credit ($20 credit for paying $10), this is a great offer to make cheap international calls. Now how to avail this Rebtel 100% bonus offer. Firstly this offer is exclusive to Free Pc to Phone Call readers : so here is the procedure. 1. Visit this special link for Rebtel 100% Bonus. 2. Alternatively, click on the image above to visit the special offer. 3. On the page, you will see "Click here to Accept offer". Just click that. 4. Your Rebtel Voucher Code for 100% bonus is automatically filled. 5. If it is not filled then ensure that "100%bonus" is filled in voucher code field of signup page. Alternatively just follow steps 1 and 3 again.! 6. Fill the registration form. 8. You will get $10 bonus and will see $20 in your account. 9. Your account is created, and your first call is free! Though, this blog readers know why one should Join REBTEL, but a few word for the ones who are new to this blog, Instead we have 20 reasons to atleast try Rebtel. 1. Rebtel is a very trusted voip provider. Absolutely no worries that you may loose credit. 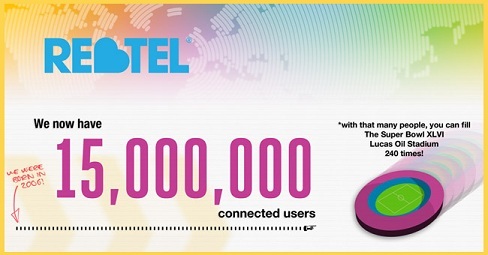 Rebtel is one of industry best voip provider. 2. Rated as No 1 by many voip blogs and websites. 3. Rebtel has a very good customer Support. So incase you face any issues, Rebtel will be always present to solve them! 4. Rebtel offers very cheap international calls. Already discussed that calling rate will be very less with this Rebtel bonus offer with Free Pc to Phone Calls. 5. Rebtel offers a very easy way to make calls : Enter your friend's name and international number and Rebtel gives you a unique local number for each friend. Create it once, save to your phone and keep forever. 6. You don't have any smartphone, no worries Rebtel works from your any phone. Use your regular phone to call the local Rebtel number. 7. You have smartphone. Aaah Great : Rebtel has an app for you : Rebtel for iPhone, Rebtel for Android or Rebtel for Blackberry. 8. Rebtel offers Access Numbers in your area. Through rebtel website, you can easily find Access Numbers for more than 50 countries and 80+ cities in the US. 9. You only pay for the time you talk, with no monthly plans or subscriptions. No connection or hang-up fees. Nothing but honest calling rates. 10. Rebtel offers Free International calls as well in a unique way : To make a Rebtel Free Call, simply call your friend using the local number you got from Rebtel. When they pick up, ask them to hang up and call you back while you stay on the line. You see, when you call a friend in one of the 50 countries where Rebtel is available, a number that is local to your friend is displayed on their phone. When they call you back up, the call is instantly connected and you can talk for as long as you like. For free. Your operator might charge for the call, but if you have local minutes included in your plan, you don’t pay anything for the local part of the call. 11. Rebtel offers Video tutorial for every step and you will find all the procedures very easy to use. Rebtel is a very easy to use service. 12. Rebtel offers a super cheap SMS service that, compared to your regular carrier, saves you up to 65% on your international texting. Text from apps or Text from computer (Web SMS by Rebtel). 13. Rebtel time to time new offers for new and old users. 14. Good voice call quality offered by Rebtel. It is very annoying when the call interrupts, you get delay is voice call. Rebtel works great with a good voice clarity. 15. No Pins required as like calling cards. 16. Feature of Rebtel Collect call : A Collect Call works just like a regular Direct Dial call, the only difference is that you cover the international charge for the call, while your contact pays only for a local call to the Rebtel number. 17. Use Rebtel from anywhere in world using PC to Phone Calls : PC2Phone is a new service from Rebtel. When you make a PC to Phone call, you're able to call your Rebtel contact from anywhere in the world using your regular Skype client! This means you can now make Rebtel calls from anywhere where you have access to an Internet connection. Setting up your account for PC calling is incredibly quick and easy. Go to "My Contacts" and just click the local number you want to call, then click "Call from my computer" under the contact name. 18. Rebtel offers First Free Call. 19. Rebtel Bonus Plan for Free Pc to Phone Calls users. 20. Any queries on Rebtel, we are here to help. Any suggestions on the Rebtel exclusive offer to our readers, all our most welcomed. We will try to solve all your issues, answer all your queries, and get you the best deal from Rebtel. Need more reasons, Just try Rebtel and let us/other know your feedback.